During the record-setting hot and dry years of 2012 and 2013, severe water shortages on the Wind River Indian Reservation turned fields to dust and forced cattle ranchers to sell their herds. The irrigation season runs from May to October, but warm, dry weather combined with limited water storage means “many years our irrigators are left without water from as early as the Fourth of July to mid-August,” said Mitch Cottenoir, Tribal Water Engineer. 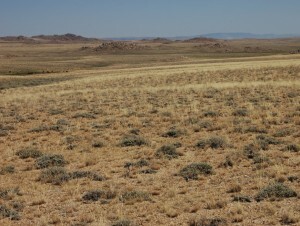 The Wind River Indian Reservation encompasses 2.2 million acres of sagebrush steppe in west-central Wyoming between the Wind River and Owl Creek mountains. The two tribes that live there, the Eastern Shoshone and Northern Arapaho, depend almost entirely on snowpack and glacial melt that flows through tributaries of the Wind River for their water supply. This alpine and high desert ecosystem at the top of the Missouri River watershed is especially vulnerable to climate change and drought—and so are the tribes that live within it. While the Wind River Tribal Water Engineer’s Office does what it can to provide climate information to water users, limited federal climate and water monitoring sites on the reservation and insufficient training among staff make it hard to collect and communicate relevant data to the public in a meaningful way. Now, an unprecedented collaboration between multiple climate research stations, universities, and the Wind River tribes is addressing those challenges head on. After the 2012 drought, Cottenoir and Northern Arapaho Tribal Liaison Gary Collins wanted to improve the reservation’s climate preparedness. Collins reached out to Shannon McNeeley, a research scientist at the North Central Climate Science Center at Colorado State University. McNeeley brought in contacts at the University of Nebraska-Lincoln’s National Drought Mitigation Center. In 2014, the group started meeting to discuss how to create tools and provide training for water managers on the reservation. Cottenoir, Collins, and McNeeley realized addressing the larger challenges on the Wind River Reservation would mean working on many solutions at once. So they applied for a $390,000 federal climate-related grant to do a multifaceted, interdisciplinary drought vulnerability and preparedness project. When that funding came through in summer 2015, the project joined other efforts underway on the reservation. “The idea is to build capacity and define parameters of drought conditions,” said Collins, which in turn will inform the tribes’ drought planning and tribal water code. The four main components of the project consist of creating a drought risk assessment, training tribal members to collect, analyze and publish climate data, compiling and supporting local tribal knowledge regarding drought and climate, and creating a locally driven drought planning model that can be shared with other tribes. To accomplish that first piece, researchers and scientists at universities and climate centers in Colorado, Nebraska, and Wyoming are collaborating to produce a large-scale assessment of drought risk and vulnerability on the reservation. They’ll integrate and ground-truth a wide range of federal, state, and local research as well as tribal knowledge. When completed, it will become “one more significant tool we have for resource management,” said Collins. To complement that reservation-wide assessment, the tribes and regional climate centers are also producing quarterly regional climate and drought summaries for the Wind River region, which review the last season’s climate, drought, and water supply conditions and look ahead to the future. Tools like the climate and drought summaries will be especially useful in advance of the annual growing season, said Cottenoir, helping his office “advise our irrigators within our community and the surrounding areas to the potential of drought situations so that they can make financial and personal decisions on what they want to do.” His office has already begun sharing the summaries with irrigators and water districts in the larger region. A large part of the overall project’s capacity building effort consists of training Wind River water technicians how to collect and analyze local climate data. To date, Cottenoir’s office and the High Plains Regional Climate Center have worked together on these summaries. The tribal water office is taking increased ownership over the quarterly summaries and eventually plans to write the reports on their own. Additional education and community outreach efforts are also underway on the reservation. Another critical piece of the project is including local knowledge from tribal members, since many people on the reservation have cultural, in addition to economic and environmental, connections to water. McNeeley has interviewed Wind River residents to learn about historical decision making, risk perception, and adaptation on the reservation during previous droughts. “We’re trying to tell a story about how drought has affected the reservation over time and how it could affect people into the future,” said Cody Knutson of the National Drought Mitigation Center, who leads the drought vulnerability project. Collaborators are also reconstructing historical drought records and studying ecological impacts of drought. All of this will inform the ultimate goal of the project: developing a reservation-wide drought plan to help prepare for and mitigate impacts of future drought. As the climate and snowpack patterns change, understanding drought and weather patterns will only become more critical, especially for water management. In addition to the drought preparedness project, the Wind River Reservation is also working on a water supply and storage study and an agricultural resource management plan. Cottenoir said all three projects, while distinct, will support and inform one another. He hopes this multifaceted drought planning effort will create a template for other Missouri Basin tribes. An ecological anthropologist by training, McNeeley said the collaborative, iterative nature of this project—involving the Wind River community in the process from the beginning and throughout—is fundamentally different from other approaches. “The new buzzword is co-production. And so we’re really co-producing the entire project from top to bottom with the tribes themselves,” said McNeeley. Ariana Brocious is a reporter for NET News in Nebraska. She reported this story while working on the Platte Basin Timelapse project.